Yeah, the problem is most of the game is saved on there now, unlike the old PS1/2 where the game was fully on the disc so you just saved game progress on the memory cards. When I bought the Xbox One I didn't know about this so assumed the 500GB to be more than enough. If I ever have to replace it I'll definitely get one with a larger hard drive next time. Another car spotted, this time in the M40. 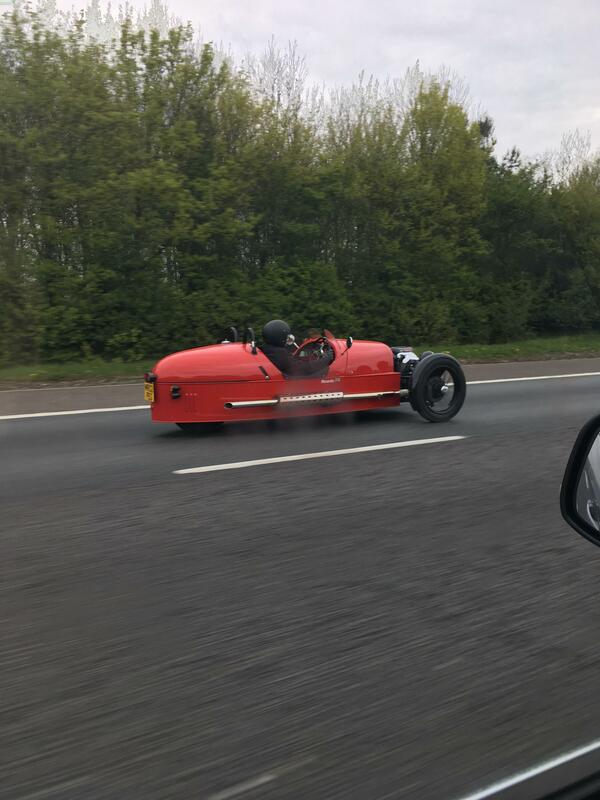 Morgan 3 Wheeler! After the success with the BP app a couple of weeks back, I decided to try the new Sainsburys SmartShop handheld scanner today...and I must admit it works pretty well! Might try the Tesco version next time... I really am getting down with all this new fangled technology lately. I couldn't do it but I'm sure thousands do! I do like this Nissan X-Trail 1.6 turbo petrol. I was looking for a Mondeo Titanium estate 1.5/2.0 petrol with X-pack, bodykit and 19's for my next car but I like a lot of the SUV's that are around now. Won't be changing til January ideally but I can't help a bit of window shopping to decide what to get. Gutted, I thought sod it, I will change my car now instead, rang the X-Trail garage and it was sold yesterday!!! Having a bit of trouble pricing mine to sell. 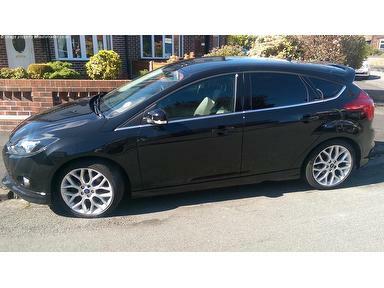 The prices vary so much for my model, 2012 Focus Zetec S 1.6 SCTi 182ps, 46k, full history, Appearance pack 2, clean car, unmarked 18's. What do you all reckon it's worth? Just seen them on Look East, they flew from RAF Wattisham to Estonia today to be used as a 'deterent'. I guess you get a different regional programme though, Look London or Look Central maybe? I'd say around £5k though, the mileage is definitely in your favour. Have you tried Autotraders valuation? I find they're usually a bit high for private sake but gives you a rough idea. Alternatively look at somewhere like Wizzle or Motorway. Lol, I can get £5500 px so a private sale would be more but how much more has got me a bit stumped! I think maybe £6000 is a good price without being greedy. They are quite rare now. Go with the PX if you've been offered that much!! I've sold 2 Mk3 PFL's under 50k miles in the last year and found no one wanted them tbh. One 1.6TDCi Titanium went for £5300. And a 1.0EB Titanium for £4500. Go with the PX if you've been offered that much!! I've sold 2 Mk3s under 50k in the last year and found no one wanted them tbh. One 1.6TDCi Titanium for £5300. And a 1.0EB Titanium for £4500. Yes, but mine is a Zetec S 182 😋, have a Google, theres not many for sale and the ones that are out there really vary in price. I think they are targeting the boy racer market as they are more affordable to buy and insure than an ST. Yes, but mine is a Zetec S 182 😋, have a Google, theres not many for sale and the ones that are out there really vary in price. There's loads for sale on the Mk3 Zetec S Facebook group. I bought my first diesel hatch at 19 and used it to tow a trailer. First diesel estate aged 20. First diesel saloon aged 21. I then had a midlife crisis during my early 20's and bought a couple of GTi6s, a Fiesta ST150 and an A3 Sport as weekend cars... So where next? A mini MPV maybe? Fiesta Active? BMax? Don't get me wrong, I do like the exterior of the ZS, but don't understand why that means you should have to put up with an ugly dash, horrible seats and no electrics inside where you spend all of your driving time...it seems like a spec that has been designed for people that are only ever outside of their car looking at it. For me, a much better option would to buy a Titanium X for all the toys (spec the App pack 2 on it ofc) then chuck the ZS bumpers and skirts on it... Can also chuck a set of Eibachs on if you want to make it a little less comfortable. 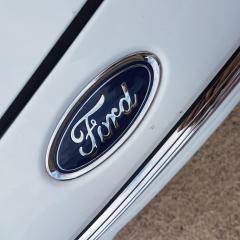 Yeah Tom, to be honest I would prefer a Zetec S exterior with a Titanium interior, best of both worlds then. That's basically how the Mondeos are that I was thinking of, Titanium X pack with 19's and bodykit. I've scoured the net and can't find another X-Trail the same spec and price as the one I pictured above, typical, get finances sorted and then can't find a car! Interestingly, the half-leather on the ST-2 and ST-3 is actually a set of covers that fit over the seat and can be replaced! Which begs the question, what's underneath? Is it a half-leather cover over the standard ST-1 Recaro seats? Does anyone know? I think I'll find time over the Easter weekend to give both seats the full Gtechniq treatment too.